Our topic this term is landscapes. We are going to explore this by starting off by thinking about what we can see around school and what we can see around our own homes using the book Window by Jeannie Baker as a stimulus. 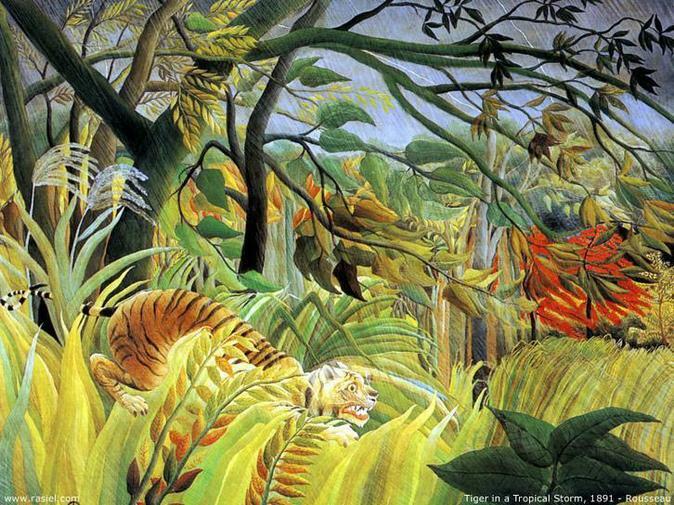 Later this half term we will be looking at rainforests/ jungles and will be using the art of Henri Rosseau as our stimulus. After half term we will be looking at the seaside. We also have our trip to the theatre in Oakengates to see a production of Cloud Babies in May. Our RE topic this half term will be "New LIfe" where we will be reflecting on how Jesus rose from the dead for us and gave us the special gift of joy and peace. PE sessions will continue to take place on a Thursday morning and will focus on developing multi sports skills this term. We will be having PE sessions outside (weather permitting) so please ensure your child has appropriate footware as part of thier PE kit with them. Forest school sessions will be on Thursday afternoons so the children will need their wellies in school that day and a warm coat. Children need to bring their reading book , diary and blue word book into school every day (in their book bags). Oxford Reading Owl Free ebooks for your child to read from Oxford reading tree. Red Fish A child friendly site for your children to explore by clicking on the different items on the page.